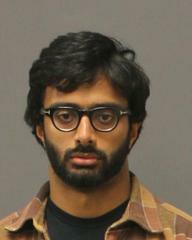 Manas Moole Reddy was arrested on November, 18, 2013, for possessing a loaded firearm on campus. He has posted bail and has been released from Orange County Jail. The court ordered Reddy to stay away from all UC Irvine campus property as a condition of his release. While Reddy is a fifth year UC Irvine student, the court order specifically precludes him from being on campus grounds pending resolution of his court case. If Reddy is seen on campus, please call 911 immediately. Receive updates directly via email by registering at Nixle.com and search for "UC Irvine Police" or text "UCIrvinePD" to 888777 to receive text message alerts only. Standard text messaging rates may apply depending on your calling plan.